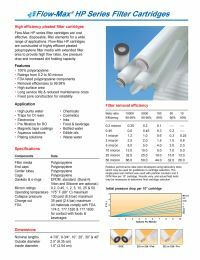 The Flow-Max HP Series Filter cartridges are cost effective, disposable, filter elements for a wide range of applications. Flow-Max HP cartridges are constructed of highly efficient pleated polypropylene filter media with extended filter area to provide high flow rates, low pressure drop and increased dirt holding capacity. High purity water, Chemicals, Traps for DI resin, Cosmetics, Electronics, Inks, Pre filtration for RO, Food & beverage, Magnetic tape coatings, Bottled water, Aqueous solutions, Edible oils, Plating solutions, Waste water.